Jaipur: In view of the severe faculty crunch at the medical institutes, which are due for Medical Council of India (MCI) inspection, the Medical Education Department recently transferred over 50 doctors from the Sawai Man Singh Medical College (SMS Medical College), Jaipur to newly established medical colleges across Rajasthan. The state was facing an acute shortage of doctors at its medical institutes which is against the norms laid down by the MCI. Therefore, the doctors were transferred to other colleges so the newly established medical colleges would recognition from the MCI. The mass transfer from the medical college has reportedly hit its healthcare facilities. The doctors who are transferred include senior professors. These include specialists in Medicine, Pharmacology, Biochemistry, Radiology, Orthopaedics, and Microbiology, among others. According to the report, ten doctors were transferred to Dungarpur Medical College from SMS Medical College and four from Kota to Dungarpur. Four Orthopaedic specialist doctors were transferred to the Government Medical College, Kota to fulfill the faculty strength as the department had proposed an increase in MBBS seats from 150 to 250. The academic session in five new medical colleges at Dungarpur, Pali, Bharatpur, Churu, and Bhilwara started from 2018-19. The doctors are waiting for the MCI inspection; they are hopeful that they will be called back once the inspection gets over. Meanwhile, the patients coming to the SMS medical college are in quandary over the shortage of doctors which took place due to the mass transfer. It is just like the story of barber who starts cutting hair of another person before finishing first one .Mostn of the medical colleges are short of faculty member , instead of fullfiling the m.c.i.criteria govt opens new medical college,and to hide their inefficiency they do this unethical work.For non clinical sujects like microbiology, anatomy etc non medical M.Sc should be allowed as faculty to fill the gap,as they have the same course study.Recently same trick has been applied by Govt. Of Bihar transferring doctors from different medical. College s to newly opened ones. Poor pay structure of doctors and not giving permanent jobs to them .it is the Nexus between beurocrats and politician who always have complex with doctors due to their popularity and they come up with these types of scheme to save their asses from public outrage .it is better to gve permanent faculty jobs to specialist doctors so that they also feel secure and work well in the new medical colleges. Shortage can be temporarily relieved by appointing retired Bonafide teachers, in good health and willing to workmay be employed on contract basis. Govt is doing this is legal…. Pvt colleges are doing it then its illegal…. 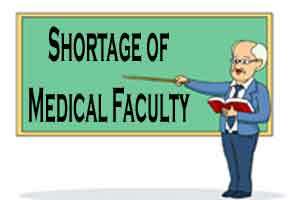 Everyone knows about to shortage of faculty … Still MCI is accepting new college project, Why…. Health Ministry should take steps towards those colleges who are waiting for approval but not getting it because of not prove their college as per MCI rule. Every thing is available in those private college except few thing due to that they failed…. I think govt should take over those college as partner and establish colleges as medical college… . Should be form some rules and regulations for those colleges… 25% seats can be declared as govt seat on which fees will be as per govt college or whatever they think. don\’t MCI not check their date of joining in the new colleges? and if MCI inspectors just want that the staff should be present in front of them and on other times we dont care….then such inspection activity become money making business….but its not new for MCI and such transfers….coz…the system is made like that….